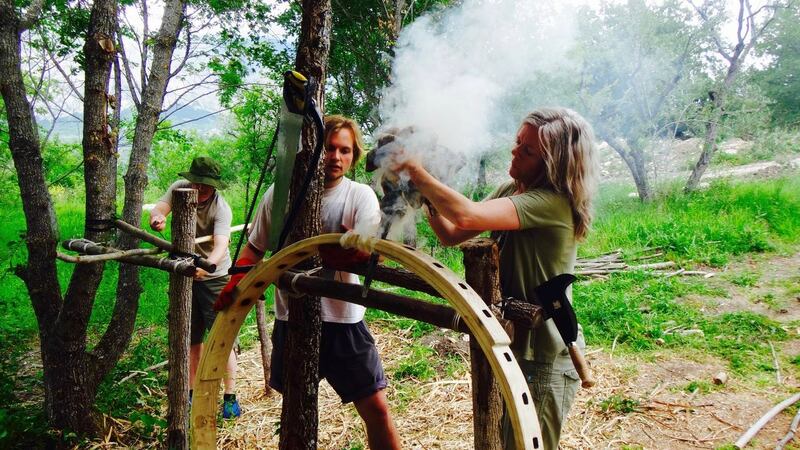 This will be a month long event, tying together some amazing wood work projects, wild outdoor living (in yurts), and fire side cooking. We will explore the creation of some products to help Glamping in Central Italy take off: making yurts, a Shepherds’ hut, a cruck frame marquee. We well know how beautiful and versatile yurts are as a living space, and are introducing the others, the Cruck Frame Marquee being more suited to a kitchen/dining room/workshop/event space. 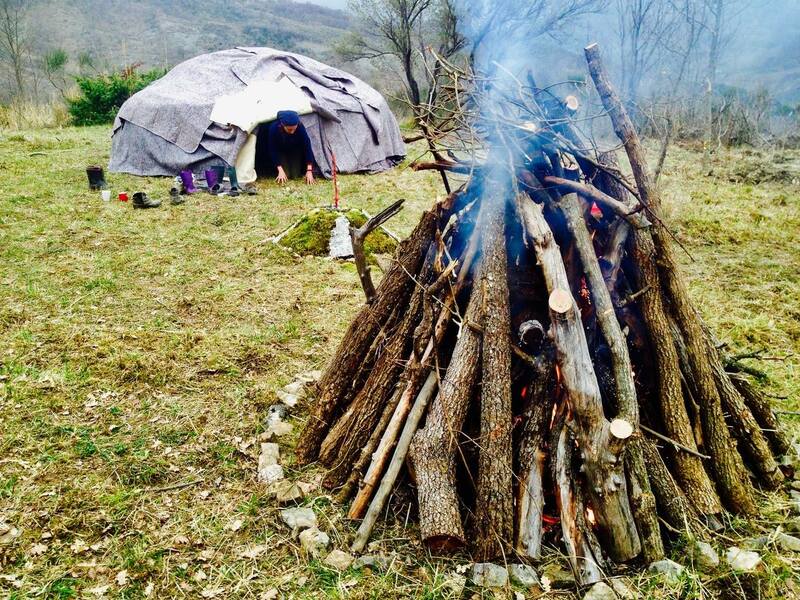 We will be living as a little tribe around the camp fire, and alongside all there will be the the Beltane celebration, conscious cooking, a sweat lodge, and some energy work exchange, maybe even a small participatory performance. One of the structures we plan to make is a Shepherd’s Hut, a wagon which was, since the 15th century and into the 20th Century, used by shepherds during sheep raising and lambing, primarily in the United Kingdom and France. 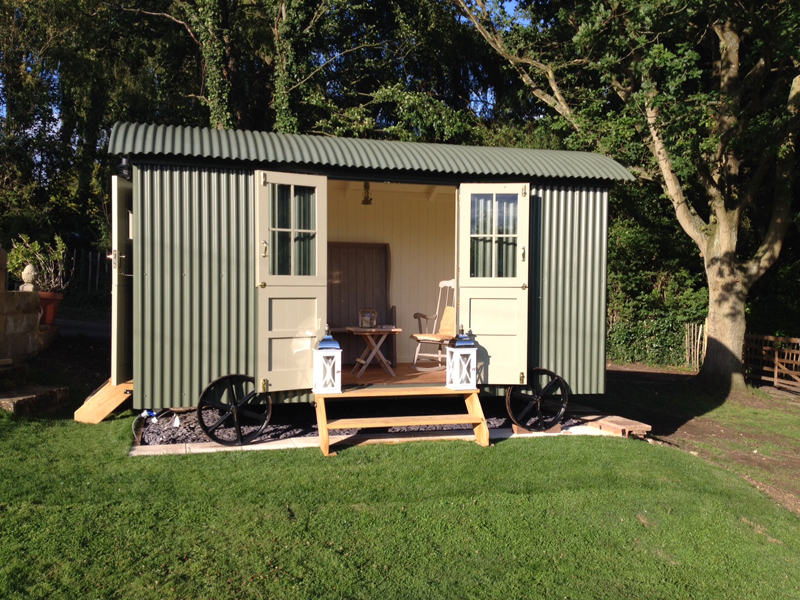 It has become a popular accommodation on UK glamping sites. 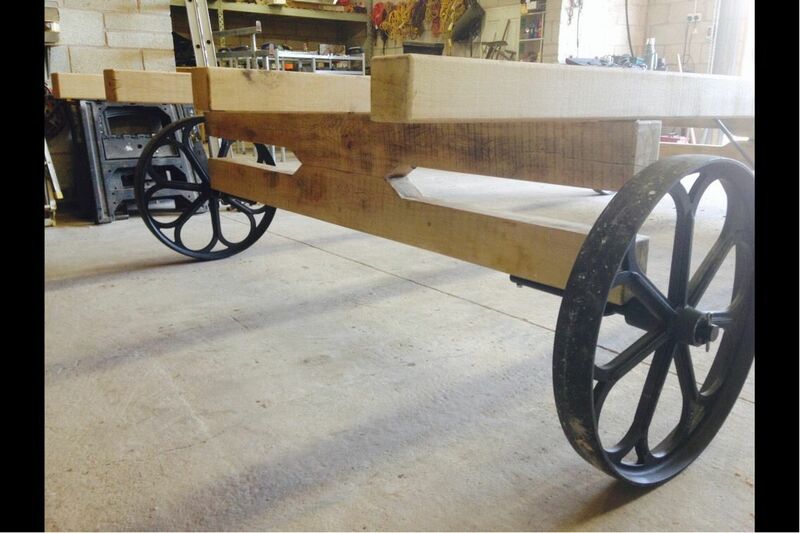 We intend to construct an oak chassis and frame with prefabricated iron wheels. 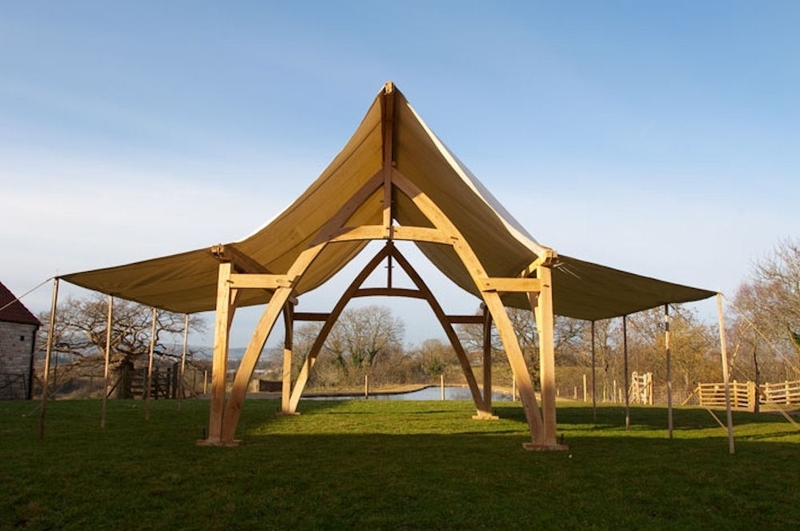 Another structure is a Cruck Frame Marquees a traditional timber framed marquee, based on a 13th century Gothic design. This mini festival is laying the foundation for the Heartland spring festival, where we come to celebrate the sacred marriage and the start of the season. This year’s theme is Sustainable Tourism, but with a twist – we will explore the role sustainable tourism has in helping to create economy in marginal rural areas and the role well-being practitioners and organic farming plays in this. But mainly we will be having fun, living togther in a tribal setting like we always do, exploring nature and our inner connection, eating good food and working outside. Admission is free, the event is run by the Heartland Association which is a small non profit, but we suggest a donation of about 12 euros a day towards food so we can keep it flowing with honey from the hive of the queen bee herself. We will be hosting from around 16th of April up to 10th of May. Brexit while you can and Italienter? There is a rural regeneration revolution happening in Abruzzo, Central Italy! Abruzzo, the Green Heart of Europe is a magical secret. 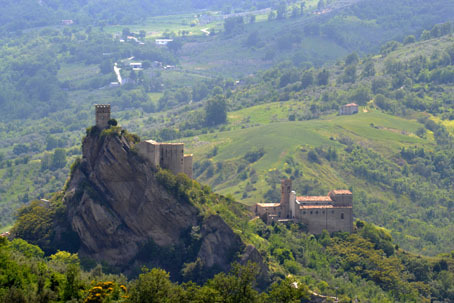 Most people have heard of Tuscany and Umbria but Abruzzo is almost unheard of, even though it has the most magnificent mountains just a short drive from the beaches of the Adriatic Coast, national parks and ancient villages with rich tradition. It is not, however gonna be the next Tuscany or Umbria full of ex-pats with holiday homes, who create a surge in the house prices, but has a new culture full of people who want to integrate with and learn from the local culture, whilst bringing new ideas and sustainable projects. As written about in previous posts, much of Southern Europe is suffering from the disease of rural depopulation and a cure is needed. As talked about in the previous post, development of sustainable tourism projects is one such cure, and our speciality is the building of glamping sites so we want to connect the places with the future guardians. Even though it is possible to find gems of places in the mountains for shockingly low prices, I’m not saying it’s all easy to set up a campsite in Italy: Italian bureaucracy is somewhat medieval with processes that would be just a click away in other European countries, needing patience-testing repetitive paperwork. Also, planning permission for a campsite can take time although the Italian administration is slowly waking up to new forms of land use. That said, the increasing call for a greener future is putting pressure on central and local governments to provide more sustainable industries and the EU has more and more grants to support such industries. Alongside this, it also recognises the need to stop the trend of rural depopulation spreading and there are grants and schemes to support sustainable development in marginalised areas. Also the global populist trend is asking the Italian administration to look at reducing taxes and help small businesses, which would make it easier and cheaper to establish a small business. We have many years of experience in setting up and maintaining glamping sites in the UK, other European countries and Israel, so have seen what works and what doesn’t and especially enjoy coming up with the perfect vision to suit the place and the predilection of the owners. 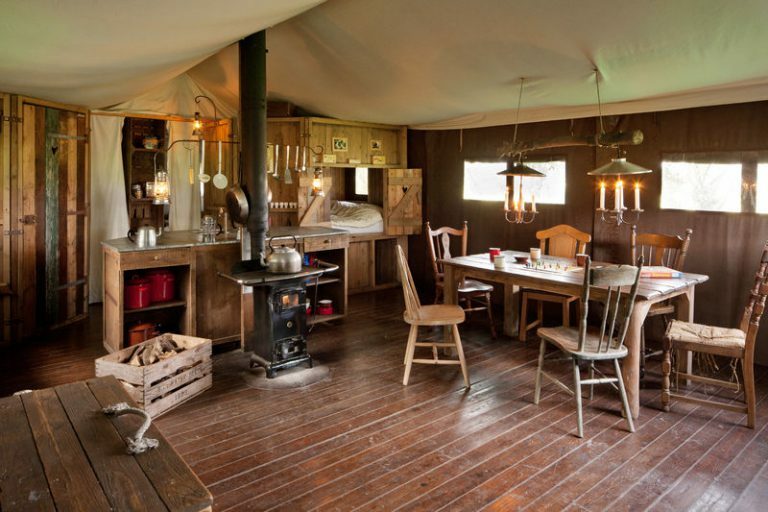 We have a network of glamping business specialists who can help with the various challenges of setting one up. Our Heartland Association is focusing on sustainable tourism projects to share this beautiful, powerful land with responsible tourists and is working with regional planning departments to make planning permission for campsites easier. 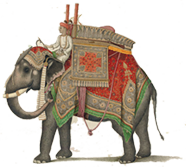 There will be more information coming later about our latest projects in Italy, but for now as well as making our UK yurts, tipis and other nomadic tents, we are now the sole agents in Italy.for Outstanding Safari Tents who make beautiful safari tents at affordable prices. We have also got Featherdown Farm on board who, if you haven’t heard of them, have a network of locations which are working farms that offer accommodation in wonderful safari-style tents with rustic furniture. They have diversified into land which isn’t a working farm as such but could be an olive grove or other rural location. If you choose to go with them, you become one of their sites and get bookings through their website. It was very well established in the UK and Holland, then expanded to France, South Africa, USA,Germany, Belgium and Ireland – now we are putting it on the ground in Italy. So if you like the idea of establishing a campsite in Abruzzo – now is the time! Get in touch if curious..